Published on March 21, 2018,	by admin in More Stuff. 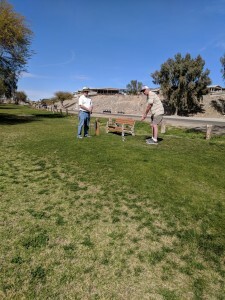 Yesterday, Richard and I played golf at a nearby par-3 course. I tried to get Dianna to play also but she wouldn’t have any part in that and opted instead to be our caddy. We actually came out with pretty close scores. 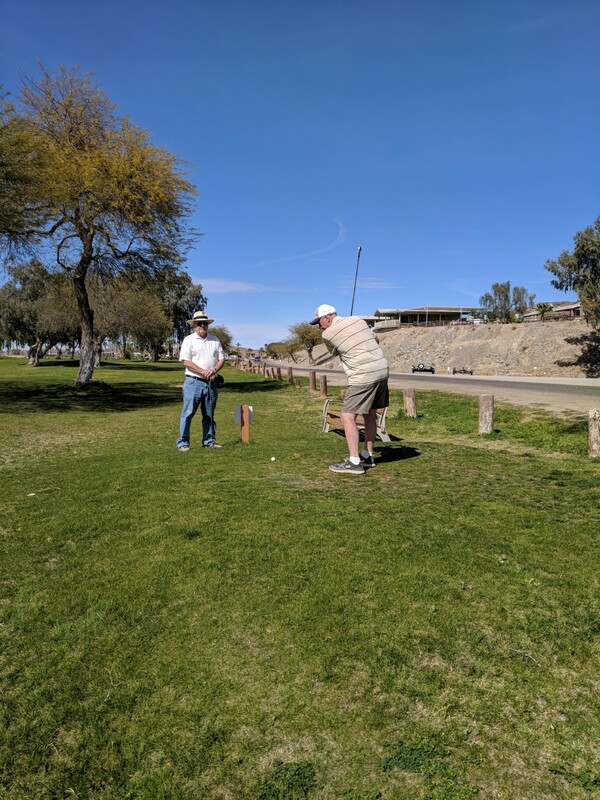 I attributed Richards play to beginner’s luck and my bad shots to being rusty from not hitting a golf ball for several years. It was a fun time that I had been thinking about every since I discovered the golf course in the little community of Hidden Shores, only a few miles from where we are camped. My golf clubs are still at my son’s house back in New York so I have been on the lookout for a few inexpensive, used irons. Par-3 golf courses are easy to play with a minimal amount of clubs. The longest hole was 122 yards, easy to reach with a well hit 7-iron. 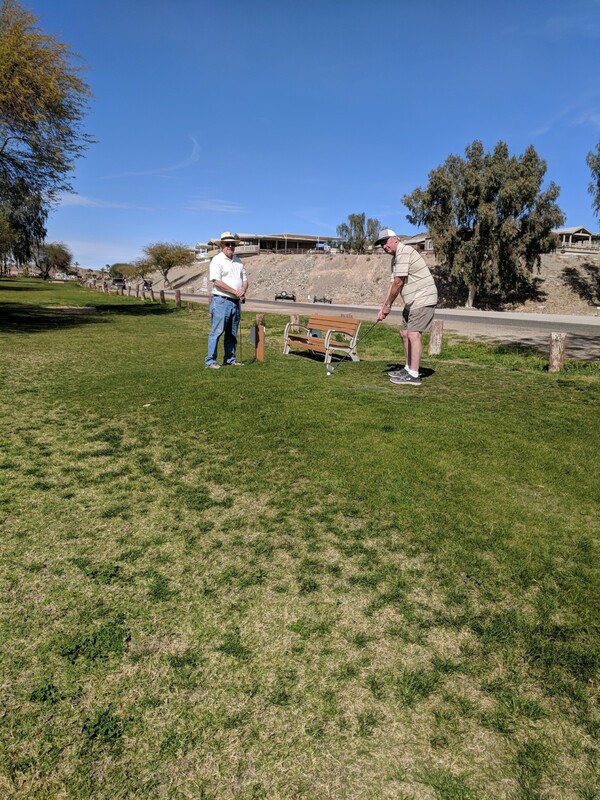 One day when we were in Yuma I suggested we stop at Goodwill and see if they had any used golf clubs. I picked up a pitching wedge for $2. We couldn’t find a putter so went across the street to another Thrift store. The clubs were 3 for $2 and there was a half-price sale going on. I purchased 3 golf clubs for 33 cents a piece! When I was in Why, AZ last month I found several golf balls while walking along a wash one day. Now, we had everything we would need for a fun round of golf. We found out that the course charges $10 greens fees and you can play around the nine-hole course as long as you want. We went around twice until fatigue started to set in and the day became too warm to continue. We didn’t have a putter so had to use a driver’s flat face to putt. Dianna carried our extra clubs and golf balls and kept score. I feel bad because we forgot to tip her for a job well done! I’m not sure if we will play again before we leave but it was a good time for an enjoyable morning. I played at an indoor simulation place where you hit the ball into a screen and a projector took over from there. That was back in the 90s and I was terrible. I suspect I would be worse today. But it sounds like you had some fun.